Above: Photograph taken at a Site of Special Scientific Interest. 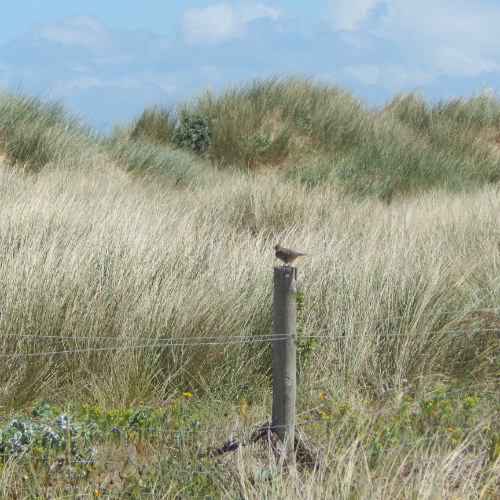 This particular site features an ecologically diverse sand dune system, which supports an abundance of species. Is becoming a beekeeper always the best way to help bees? What if you live close to an SSSI (Site of Special Scientific Interest) or close to an ecologically sensitive area? 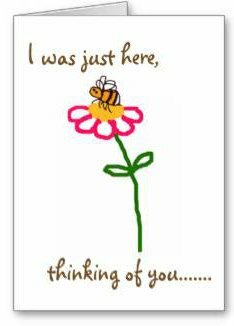 It’s wonderful that so many people want to help the bees. However, it must be noted that there are a number of issues affecting bee populations (as well as other pollinators) and that the impact of each issue may vary according to the type of species. Therefore, deciding to become a beekeeper will not solve all the problems, and it is not always the best way to help bees generally - in fact, it may be completely inappropriate. I do not write this in order to make an enemy of honey bees and beekeepers - in fact, a page outlining the importance of honey bees can be found here. However, it's my view that sensitive eco-systems and the species they support (including wild bees and other pollinators), need to receive consideration before installing bee hives in the vicinity. 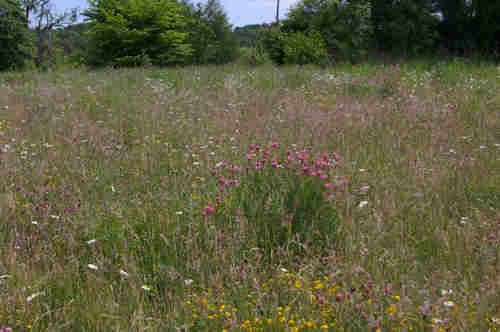 Above: This site features a wildflower meadow in a nature reserve with restricted human access. It supports a number of rare plant and amphibian species. Some countries assign special status or protections to certain areas of landscape. In the UK, for example, there are national parks and forests, ‘Areas of Outstanding Natural Beauty’, protected nature reserves, and also Sites of Special Scientific Interest (SSSIs). Awards and designations are granted for a variety of reasons. An area may receive special status or protection because it is important for particular groups of species; it may be home to rare species; have special geological features, or be especially rare in its characteristics. An area may or may not be of special value to pollinators, but that does not mean we should not be careful about our activities close by! "We live next door to an environmentally sensitive area. Is it okay to keep honey bees?" I received a wonderful, kindly email from a lady very keen to help bees, querying about hiring a bee hive. (Please note, none of the photographs on this page relate to the specific query). "Hello. We have a big wild garden next to an SSSI. Lots of bees but no honey bees. I would love to support bee populations but have no knowledge of bee keeping. Can I hire a hive which would be looked after? Quite happy to contribute. 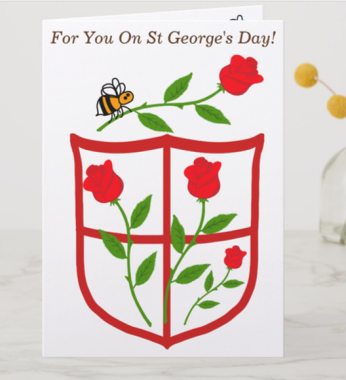 Best wishes….."
"In such circumstances, and with you living next to an SSSI, I honestly would allow nature to take its course, and let the wild bees reign supreme in the area. Although there have been some problems for honey bees, there are already plenty of people taking action to keep bees. Populations of wild bees, with no 'keepers' cannot so easily be bred and population declines will take time to recover. This needs to happen primarily with habitat enhancement and preservation. The best thing you can do is not keep honey bees, but create a haven for wild bees and pollinators. Ensure no pesticides are used, and perhaps contact those responsible for the SSSI, and ask what you should plant in your garden to fit in with the SSSI (without endangering or compromising it in any way), whilst at the same time, helping pollinators. In general, however, crevices provided by stone walling and rockery, a little bare ground, and perhaps a small wild pond, are also helpful to bees and as I say, these are general ways you can help. I recommend that people cut back old stalks in spring, and rather than burn them in autumn, put the stalks at the back of the garden, for the simple reason that dead, hollow plant stalks may have teeny tiny bees overwintering inside them." It is obvious this lady wants to help the bees and the environment. What kind of SSSI is it (is the SSSI award primarily based on plant life, amphibian life, or invertebrates, peat or bog landscape for example?). 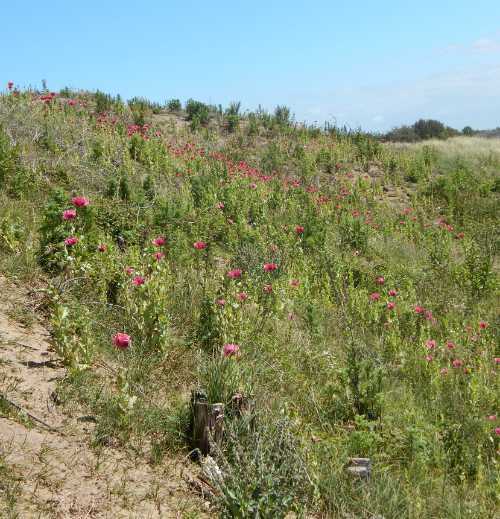 How large is the garden, and how might the rest of the surrounding landscape affect the SSSI? Unfortunately, due to the volume of emails I receive and the limited time I have available, I am unable to approach questions from visitors in so much detail. Nevertheless, even with fuller information, my response is unlikely to have differed. However, for the benefit of visitors generally, it’s worth expanding further. Some of the issues faced by bees and other pollinators are general, whilst others are specific. For example, insecticide use is of general concern, whilst Varroa mite does not affect wild bees, but it does affect honey bees. Poppies demand a visit from the local pollinator population. 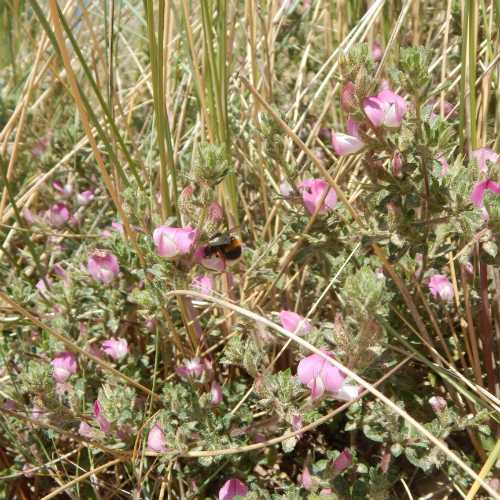 Habitat loss affects all bees and pollinators, but probably affects wild species more (apart from wild colonies of honey bees – more prevalent in some countries than others). Most beekeepers make an effort to cater for the honey bees they keep: they adapt their gardens, or move the bee hives to different locations to ensure the bees have plenty of opportunity to forage. Such locations could include farms, orchards, or even private parklands. In addition, steps are taken by those who specialise in rearing queens and nucs – i.e. ‘nucleus’ colonies to sell to beekeepers (there may be issues around genetics and the breeding of bees, but that’s a separate matter). 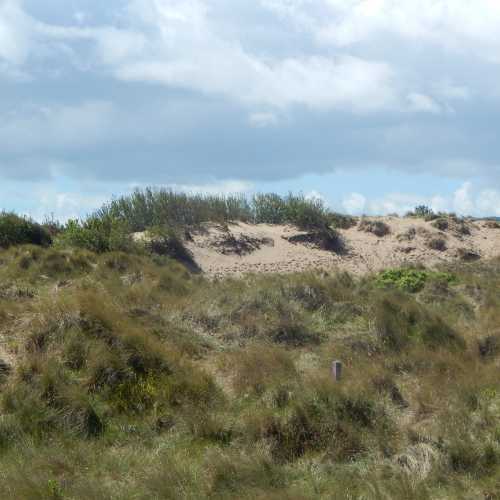 This SSSI features an ecologically diverse sand dune system, which supports a rich diversity of plant, pollinator, amphibian, bird and invertebrate species. However, wild bees are very much dependent on the local landscapes around them, and have rarely (if ever!) been at the forefront of considerations for local authority planting schemes, let alone general land management and development purposes. Indeed, it’s only recently that gardeners have begun to ask more questions about the types of plants they grow, and whether they have value for pollinators. Some pollinators may depend on a limited number of flowers for food, which only grow in particular habitat scenarios. If these habitats disappear, there is a risk the bees disappear along with them. 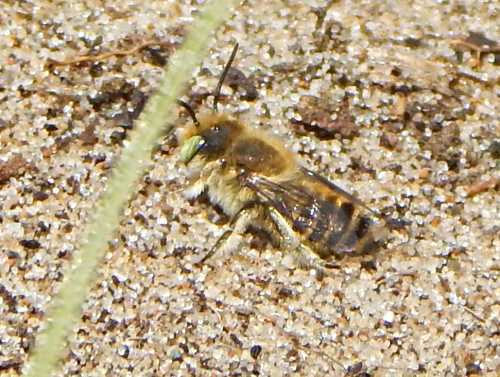 Megachile leachella (Silvery Leafcutter Bee) can be found nesting in the sand dunes (this one's a male). 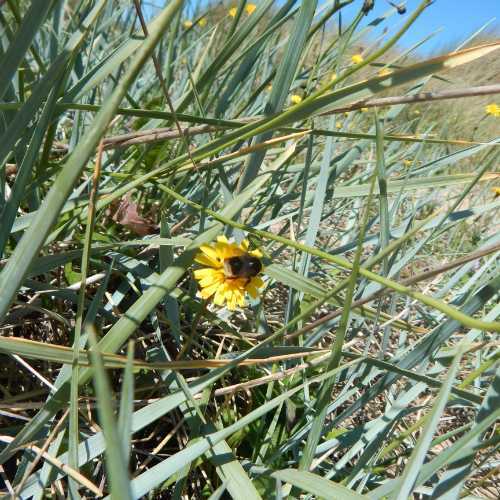 It’s important to recognise that introducing a colony of honey bees (which could consist of 60,000 bees at its peak) could introduce competition for forage on limited number of rarer flower species that are vital for the survival of other pollinators. It's also possible that the local flora may not be entirely adequate or sufficient for the introduction of a honey bee colony (which remember, will grow and at some point will swarm and produce a further colony). 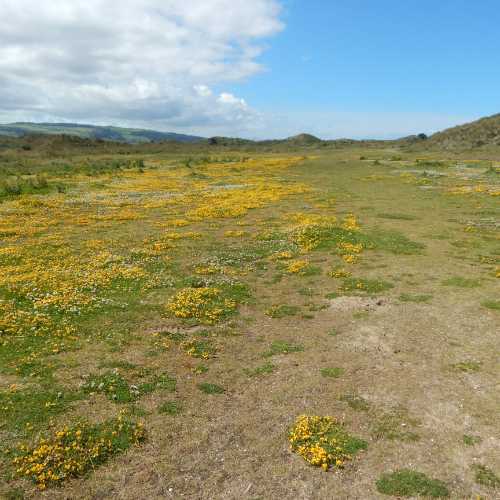 Ordinarily, I would tend to propose the answer is to “plant more flowers for bees”, however, whilst this is appropriate in gardens and parks, introducing garden plants close to an environmentally sensitive area, is not necessarily a good idea. At first glance, some wild sites may appear barren. But look again more closely, observe through the seasons, and you'll see flowers peeping up among the grasses. Seeds may be carried from a garden into the SSSI landscape, and gradually transform the area over time. It may look pretty, but it is not necessarily a good thing for biodiversity! Indeed, it could, over time, alter soil structure, soil PH and ultimately challenge the survival of the species (plant, invertebrate, and vertebrate) currently dependent upon it. Where there are nectar rich flowers, there is food for bees. A difficult soil for managing in the garden can provide ideal growth conditions for wild flowers. Therefore, on balance, if you are thinking of becoming a beekeeper in order to help bees, I would urge you to reflect on the landscape of your local area. Do you live close to a sensitive eco-system? If so, I recommend you contact those responsible for managing the landscape close to you. Find out how you can help bees and other pollinators in a way that complements the natural landscape in which you live. Ultimately, this is likely to be the best way to help the environment, and the bees too!